This week, federal tax reform advanced through the full U.S. House of Representatives and the key Senate committee. This special edition of Nonprofit Advocacy Matters provides charitable nonprofits and their stakeholders with information to plan and advocate on behalf of their missions. The House of Representatives passed its version of the Tax Cuts & Jobs Act, H.R. 1, on November 16, 2017, exactly two weeks after the bill was introduced and without allowing any amendments to the original bill except by the Chair of the Ways and Means Committee. The vote was 227 to 205, with thirteen Republicans joining all Democrats in opposing the bill. The measure was touted by supporters as needed tax relief for middle-class taxpayers and small businesses. Opponents criticized the bill as benefitting the wealthy at the expense of lower-income wage earners and unfairly favoring corporate interests. Republicans who voted against the bill tended to be from states with higher rates of state and local taxation who felt that repeal of the state and local tax deduction in the House bill would result in double taxation and tax hikes for their constituents. While more than a dozen provisions caught the attention of most nonprofits (see the Comparison of the House and Senate Tax Bills below), three in particular stood out: politicizing the 501(c)(3) community, depressing charitable giving by more than $13 billion yearly, and the resulting cuts to domestic spending that will follow; all are discussed below, after the Senate update. Late Thursday night, November 16, the Senate Finance Committee completed a volatile week of debate over the competing Senate version of tax reform that, in the view of Democratic Senators, was “a moving target.” The initial summary of Chairman Hatch’s draft bill (called the Chairman’s mark) was released on November 9, but then significantly changed on Tuesday, November 14 after the Committee had debated the draft for two days. Most controversial of the changes in the Chairman’s modified mark is a provision to effectively repeal the individual mandate in the Affordable Care Act (ACA or “Obamacare”). The Congressional Budget Office projects that the change would save the Treasury $338 billion in the first 10 years, but also cause 13 million Americans to lose their health insurance and drive up some insurance premiums by an average of ten percent per year. The version of the bill approved by the Committee also lowers tax rates for individuals, but only temporarily: nearly all of the new tax code provisions relating to individuals, including rate cuts, the increased standard deduction, repeal of the alternative minimum tax, and other provisions would expire in 2025. The measures that pay for tax cuts, including repeal of the deduction for state and local taxes, would also disappear after 2025. In contrast, the bill would make business tax cuts permanent. See the Comparison of the House and Senate Tax Bills below. Given the great diversity of nonprofit missions, the provisions spread across hundreds of pages in the two tax reform bills would impact different nonprofits in different ways. That said, three issues would touch the work of almost all nonprofits. Previous editions of Nonprofit Advocacy Matters have discussed each in detail, so the following focuses on what happened this last week. Representative Kind also spoke to the issue of dark money in politics, stating that the change in the Johnson Amendment “could be a backdoor attempt for a lot of political contributors now to get tax-exempt contributions to these organizations for direct partisan political campaigns.” He pointed to the estimate from the Joint Committee on Taxation that the provision would cost the U.S. Treasury more than $2 billion, which the National Council of Nonprofits explained last week would amount to between $6 billion and $8 billion (depending on each donor’s tax rate) in charitable donations to newly politicized-churches and charitable nonprofits. The Senate bill does not contain any such language, although it could be inserted either through amendments on the Senate floor or through a conference committee. What You Can Do: Call your Senators and tweet your Senators to tell them not to politicize charitable nonprofits, houses of worship, and foundations, and to insist that the final tax reform bill does not touch the Johnson Amendment. If you get a chance, let your Representatives know that Section 5201 of the House bill is an outrageous affront to the nonprofit community and must be deleted from the final tax reform bill. And if you haven’t done so already, sign onto the Community Letter in Support of Nonpartisanship and join more than 5,500 charitable nonprofits, foundations, and other organizations in support of retaining current law. See who has already signed the letter from your state. Another major concern with both tax bills is the adverse impact on giving to the work of charitable nonprofits. Neither the House nor the Senate version provides any relief for the projected loss of billions of dollars yearly in charitable giving that would result from nearly doubling the standard deduction. In a news release, the National Council of Nonprofits explained that as a result of the higher standard deduction, “nonprofits will also have to deal with huge reductions in resources as the House bill denies 95 percent of Americans the ability to take charitable deductions, resulting in a devastating loss of more than $13 billion in giving each and every year.” (This week, the Tax Policy Center recalculated the reduction in giving to be as high as $20 billion a year.) To prevent the significant losses in donations and the resulting reduction of services in communities, many advocates for nonprofits and foundations had called on Congress to enable all Americans to receive a tax incentive for giving back to their communities by making it universally available – a universal deduction. Senators Stabenow (D-MI) and Wyden (D-OR) filed an amendment at the beginning of the Senate Finance Committee markup of the legislation that would create a universal deduction with minor limitations. (Stabenow-Wyden Amendment #9, p. 179 of Master List of Amendments.) That bill was debated in the Committee on November 16, but failed on a party-line vote, as were all other Democratic amendments. There is, however, bipartisan recognition in both chambers that the tax bill creates a serious problem for charitable giving. Last month Representative Mark Walker (R-NC) introduced the Universal Charitable Giving Act (H.R. 3988), a bill that would create an above-the-line deduction for charitable donations made by people who do not itemize. Charitable donations could be deducted up to one-third of the value of the standard deduction, which would be $4,000/individual and $8,000/couple if the standard deduction were to be nearly doubled, as currently planned in the House and Senate bills. This week, Senator James Lankford (R-OK) introduced the Senate version of the Universal Charitable Giving Act, (S. 2123). Because there now is bipartisan recognition of the problem, nonprofit and foundation advocates are hopeful that one of the universal deduction proposals, or a modified version, will be considered when the tax bill reaches the Senate floor, currently scheduled for the week after Thanksgiving. Neither nonprofits nor foundations have enough resources to subsidize government that much when people in need – and indeed, in greater need after severe spending cuts – turn even more to nonprofits for assistance. What You Can Do: Let your state and local government officials, and their associations such as the municipal league, know of your opposition to the impact of the tax bill on the federal deficit and the likely cuts that will be felt by all parties, including charitable nonprofits. This can lead to coalition building and advancing mutually beneficial solutions. Also, share your concerns with local news media and give them real-life stories of what cuts will mean in your community. Stay connected with your state association of nonprofits to learn and share ideas for helping all nonprofits advance their missions. The House-passed bill will be sent to the Senate and serve as the legislation that the Senate takes up for debate scheduled for the week after Thanksgiving. Senate Finance Committee Chairman Hatch (R-UT) or his designee will likely offer a manager’s amendment that replaces the House version with the legislation approved by the Finance Committee on November 16. Because the bill will be brought to the Senate floor under the budget reconciliation process, filibusters will not be permitted and the debate will be limited to a designated number of hours. House Speaker Ryan has stated repeatedly that the House and Senate will take their separate bills to a conference committee formed for the purpose of resolving the difference in the measures. If that occurs, the separate chambers would be called on to vote on the new version of the bill. There is speculation that the process will not be so transparent, and that Republican leaders in the coming days will seek to negotiate an agreement that changes the Senate bill that would go to the Senate floor for debate and voting during the week of November 27. Under this approach, the House would take up and enact the Senate-passed bill without amendments. Either way, Republican leaders in the House, Senate, and White House want to enact something before Christmas. The attached comparison chart has been updated to reflect the latest changes to the House and Senate bills. Highlights include: Each bill adds to the federal deficit by $1.5 trillion over 10 years by lowering individual and corporate tax rates, and nearly doubling the standard deduction while repealing most deductions and exemptions. Both bills would immediately double the exemptions under the estate tax to exclude estates valued at less than $11 million for an individual and $22 million for couples; the House bill goes further and completely repeals the estate tax after 2024. The House and Senate both turn to the nonprofit community for new revenue, proposing to impose excise taxes on some nonprofit college and university endowments as well as on salaries of higher-paid employees of nonprofits. Significantly, unlike the House version, the Senate bill does not currently include language weakening the Johnson Amendment, streamlining the private foundation excise tax, nor a provision eliminating private activity bonds upon which many nonprofits rely for capital financing. The Senate bill does include several new provisions that could be problematic for charitable nonprofits, including expanded unrelated business income taxes (UBIT) and rules on intermediate sanctions. See the National Council of Nonprofits’ House-Senate Comparison Chart. - Wisconsin Council of Churches, Repeal of the “Johnson Amendment,” November 15, 2017, delivering a letter to Wisconsin congressional delegation. - Letter to House leaders signed by 55 Jewish groups, November 9, 2017. - Statement of Senator James Lankford (R-OK) upon introduction of the Universal Charitable Giving Act, S. 2123, legislation to allow non-itemizers to deduct up to one-third of the standard deduction for donations to charitable nonprofits. This would amount to $2,100/individual and $4,200/couple under current law, and $4,000/individual and $8,000/couple each year under the Senate tax reform bill, if enacted. - Letter to Members of Congress from Americans Against Double Taxation, November 15, 2017, expressing opposition to the proposal in the House version of the Tax Cuts & Jobs Act, H.R. 1, to repeal the state and local income tax deduction. The National Council of Nonprofits joined 65 national and state organizations in signing the letter. No on H.R. 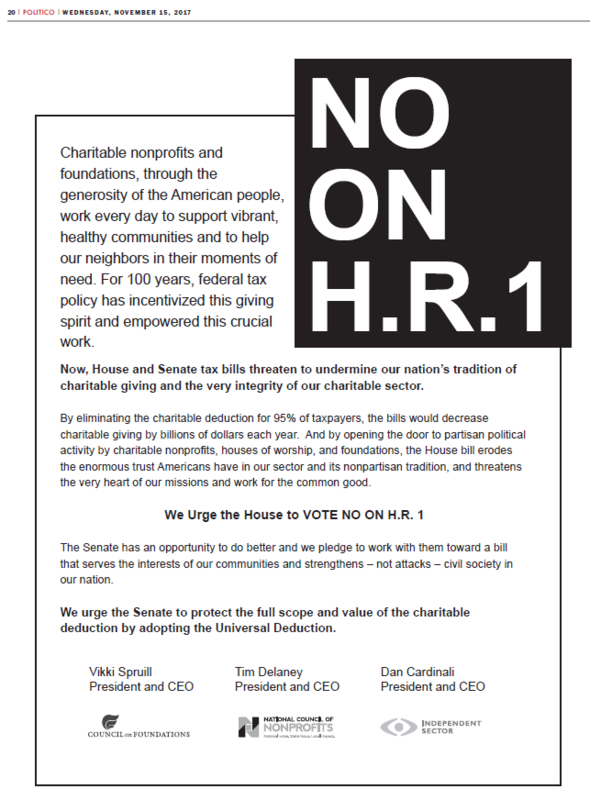 1, full-page advertisement in Politico, November 15, 2017, placed by the National Council of Nonprofits, Council on Foundations, and Independent Sector, making the nonprofit and foundation case for the defeat of the House version of the Tax Cuts & Jobs Act, H.R. 1. Community Letter in Support of Nonpartisanship, UPDATED September 5, 2017, signed by more than 5,500 organizations from every state and every segment of the charitable and foundation communities, makes a strong statement in support of nonpartisanship and urges those who have vowed to repeal or weaken this vital protection to leave existing law in place for nonprofit organizations and the people they serve. See who has signed the letter from your state. Add your organization’s name.